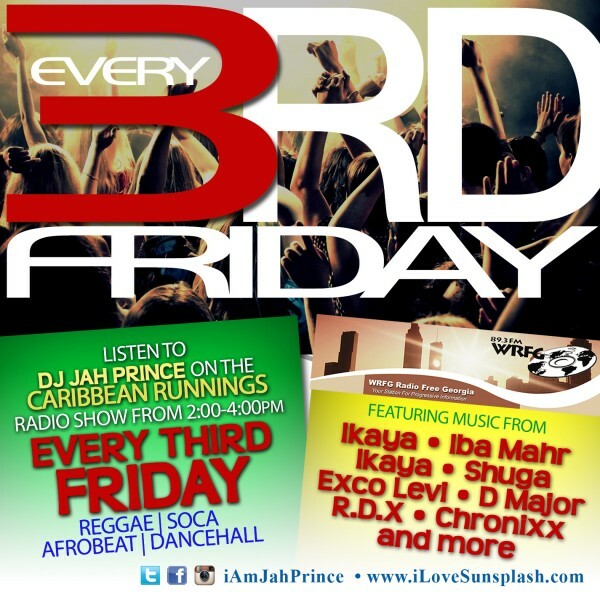 On this weeks radio program DJ Jah Prince spins another diverse set of straight reggae music including some exclusive tracks from his favorites from Tajh Purple Crown, Carimi, Bunji Garlin, Skrillex & Diplo and new music from Shuga. 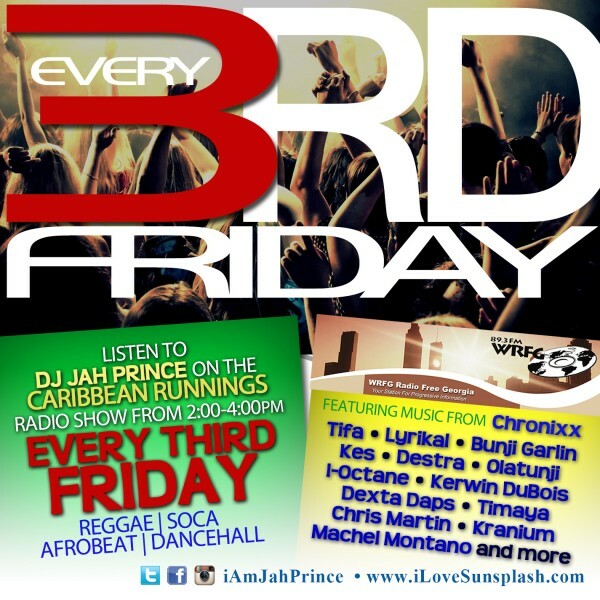 Jah Prince spins every 3rd Friday on the Caribbean Runnings Show on Atlanta’s 89.3fm, your community information station (www.wrfg.org). On this weeks radio program DJ Jah Prince spins another diverse set of straight reggae music including some exclusive tracks from his favorites from Machel Montano, Morgan Heritage, Lyrikal, Bunji Garlin, Timaya and new music from Destra. Jah Prince spins every 3rd Friday on the Caribbean Runnings on Atlanta’s 89.3fm, your community information station (www.wrfg.org). On this weeks radio program DJ Jah Prince spins another diverse set of straight reggae music including some exclusive tracks from his favorites from Machel Montano, Jemere Morgan, Kelissa ft Chronixx, Bunji Garlin, Timaya and new music from Kalado. 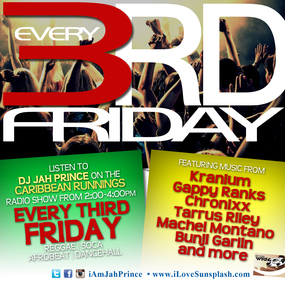 Jah Prince spins every 3rd Friday on the Caribbean Runnings on Atlanta’s 89.3fm, your community information station (www.wrfg.org). 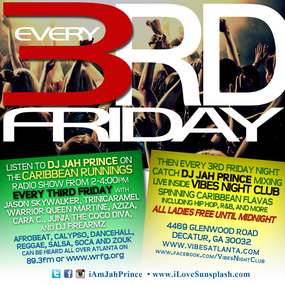 Jah Prince spins Caribbean, African and American music at the Vibes Night Club in Decatur several times per month. For over 9 Years alongside DJ Rasta Root, he welcomes you to his event called ‘Face Off Fridays’ held every second Friday at MJQ Concourse. Listen weekly on www.DaFlavaRadio.com for the ‘Sunsplash Mix Show’ Saturday Mornings from 10:00 am to 1:00 pm (Eastern). This show is also heard on AB&L Radio, MovementsRadio.net and in the streets of Gambia on Vibes FM 106.1 & Radio 971 in Dubai (UAE). Also listen for ‘Love Ultra Radio, the modern R&B, Soul, Urban and Pop-Fresh mix show heard Tuesday evenings from 9:00 pm to 1:00 am (Eastern). Jah Prince dedicates the playlist to soul, urban and pop-fresh music, then adds a comedy segment & motivational moment, geared for a mature audience. 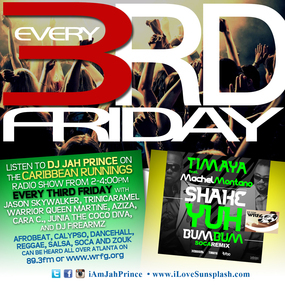 On this weeks radio program DJ Jah Prince spins another diverse set of straight reggae music including some exclusive tracks from his favorites Machel Montano, Timaya and Kes! Caribbean Runnings is heard every Friday on Atlanta’s 89.3fm, your community information station (www.wrfg.org). On this weeks radio program DJ Jah Prince spins another diverse set of straight reggae music including some exclusive tracks from his favorites Shaggy, Sizzla and SOJA! Caribbean Runnings is heard every Friday on Atlanta’s 89.3fm, your community information station (www.wrfg.org).